Part 4 of our 5-part series on Quick Asian dishes (inspired by Jaden’s 15 Minute Asian Light Meals contest) swings back into Chinese territory after taking a detour through India with our “Mustard Potatoes” post. A couple of weeks ago, Annie catered a lunch to thank all the volunteers who helped out at our church’s summer VBS program. She needed something that she could prepare in mass quantities ahead of time, cook fast, and please the Asian palates of the volunteers. She decided to make a big batch of kalbi. Barbecue – meat cooked in the heat and smoke of a wood fire – is an American tradition. Different parts of the country have their distinctive styles of barbecue: pulled pork from North Carolina, pork spareribs from Tennessee, beef brisket from Texas. 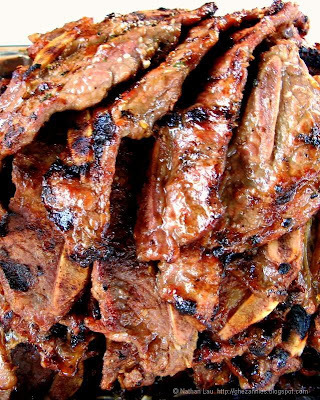 Even California has it’s own distinctive style of barbecue: the tri-tip. Tri-tip is a cut of beef not normally seen in parts outside the western United States. 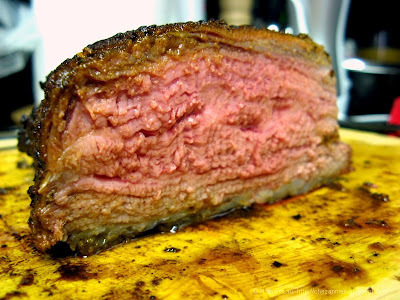 It’s a triangular-shaped (hence the name “tri-tip”) piece of meat from the bottom of the sirloin. It is tender, has just the right amount of fat, and can be roasted, braised, made into ground beef, cut into steaks and grilled, or as I like to prepare it, smoked. Barbecued tri-tip is very popular in the Central Coast area of California, around Santa Maria. The way they do it is to season the roasts simply with salt, pepper, garlic powder and parsley, then cook them on large grills suspended about a foot over coals made from the red oaks common to the area. Since I don’t have a large grill or logs of red oak readily available, I will be cooking my tri-tip roast in my trusty Weber Smokey Mountain bullet smoker. Yes, Veronica, it is possible to do high-temperature grilling on the WSM. But first, a rant about lighting charcoal. We went and bought another large, fresh corned beef brisket from Lunardi’s deli to celebrate St. Patrick’s Day. As usual, we have leftovers. I’m sure you’ve got some leftover corned beef too, but maybe you’re like me and don’t want to eat nuked leftovers when you’ve still got the memory of the real deal on your tongue. So, I’ve updated my Corned Beef Hash post to make it easy for you to finish that leftover corned beef while still keeping your tongue and tummy happy. Enjoy! 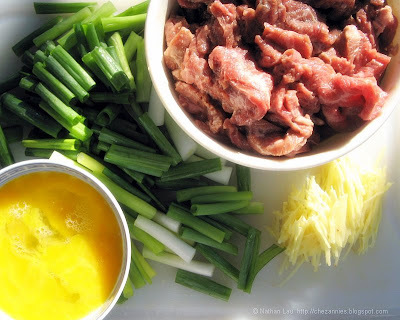 Click here to go to the updated Corned Beef Hash article! SWIFT Theme by Satish Gandham. 53 queries in 1.964 seconds.